"I added the dressing and now myself and daughters are asked to bring this to potlucks - constantly! 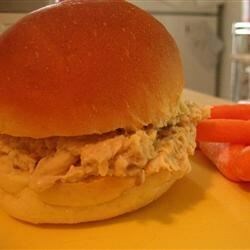 I don't especially care for 'regular' shredded chicken sandwiches, but really like MY version." Shred chicken, and place in a large pot or slow cooker. Stir in soup and water. Stir in the seasoning mix from the stuffing, and then stir in the dry stuffing mix. Cook over medium heat until heated through. Spoon onto buns, and serve. Everyone liked this recipe and it is SO easy! I used 1 1/2c of Chicken Stove Top Stuffing instead of the dry bread stuffing. It turned out great! This recipe is so quick & easy. A great way to use up leftover chicken. It sounded a little odd to add the stuffing "inside" the bun, but it is delicious! My husband asked me to make it again! This is a favorite of my family.I used turkey instead of chicken and chicken broth insted of the water. It is great for paties! I recieved many compliments!! !